Super Mario 3D Land, Mario Kart 7, Sonic Generations and Resident Evil: Revelations cannot arrive soon enough, to the delight of 3DS owners eager to play the latest and greatest games, but also to improve the system's retail space in stores like GameStop and Best Buy. 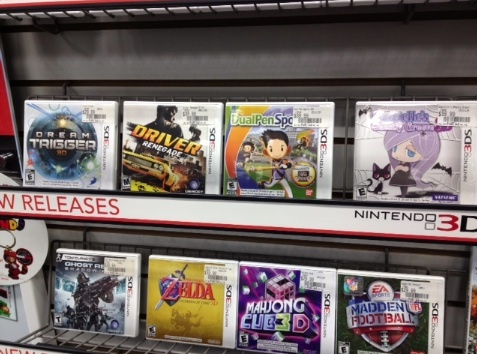 Blink while walking into one of these places, and you'll likely miss the 3DS section, often wedged between the more spacious DS and Wii areas. Not much to choose from here. Top and bottom shelves? Same deal. To be fair, those systems debuted in 2004 and 2006, respectively, and had time to amass significantly bigger libraries. That said, there's no denying 3DS has yet to see many high profile games, outside of The Legend of Zelda: Ocarina of Time 3D and Star Fox 64 3D. While browsing the shelves (AKA slim pickings) at a local GameStop, we spied such disasters as Cubic Ninja, Splinter Cell 3D and Spider-Man: Edge of Time. There were handful of standouts, a Super Street Fighter IV 3D Edition here, a Pilotwings Resort there, but a depressing scene nonetheless. Ultimately, it doesn't look inviting to prospective 3DS owners in search of reasons to spend $169 for the machine. With this in mind, we take comfort in the fact that the DS lineup was, for the most part, hideous for at least a year following launch, with the likes of Ping Pals, Sprung and The Urbz: Sims in the City infesting shelves. When compared to those abominations, 3DS' meager lineup looks outstanding. At the same time, with PlayStation Vita on the horizon, a few high profile hits would definitely improve 3DS real estate, not to mention our own personal game collections.